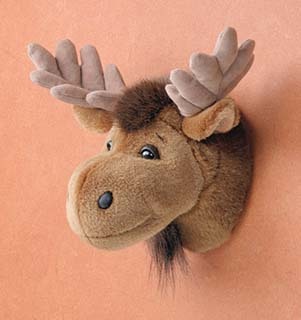 Leon features deep nostrils, the characteristic scruffy muzzle and quizzical eyes of the majestic bull moose. "Born" in December, he was going to be named Noel, but someone rearranged the letters to spell "Leon" and it stuck. He looks wonderful over a fireplace or in a larger office. 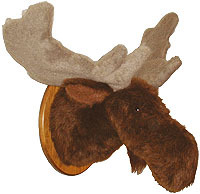 Product specs: Stands 19" from the wall with a 24" adjustable antler span and a 27" girth. Ready to hang; choose big-game shoulder mount or plaque mount. Plaque size: 11"x14"